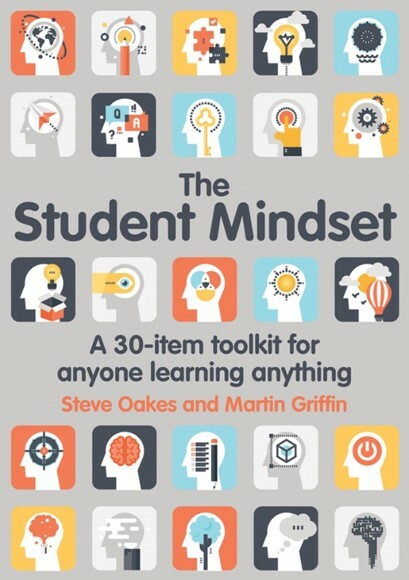 I have read lots of books about study skills, revision and exam technique. 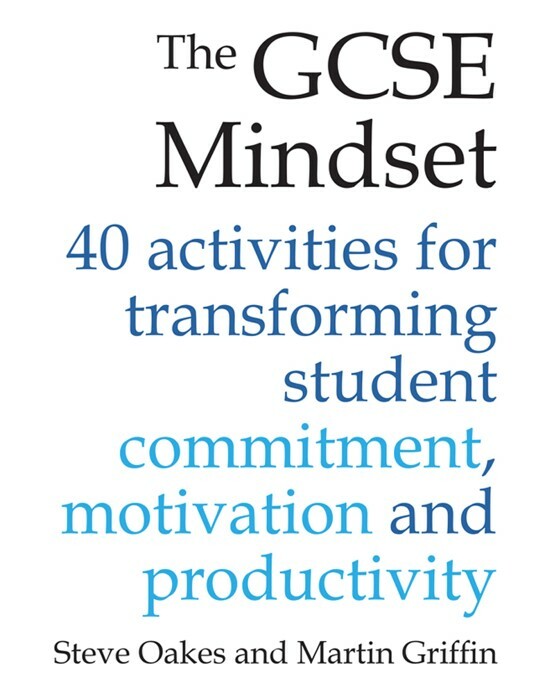 All this is particularly pertinent as my own kids have A levels and GCSEs this Summer. Only last month, I discovered a new series of books which were the best I’ve come across on this topic. A taste of what they advocate is shared in the vlog below. Dear Rachel, I am really dreading my upcoming GCSE exams and all the stress that comes with it. I find it so hard to deal with all the pressure of having to buckle down and work and wish I could ignore all the expectations of my friends and parents who are constantly asking me my marks. The stress is really hectic and causes me to feel anxious and not sleep properly. Please help! I totally remember that feeling when I had exams. Some stress can actually help you to feel more motivated to work and certainly an adrenalin rush improves concentration in the actual exam. It’s a fine and difficult balance, as too much anxiety can lead to panic and underperformance. Doing well in your exams should be to make you feel good. It’s not to satisfy your parents, teachers or impress your friends. True gratification comes from within and only you are responsible for your own success. On results day, you want to feel you gave it your best. Whilst tempting, it can be really unhelpful to speak to friends about how they are progressing. Try not to measure yourself against them. They may be the type to say “I’ve been making notes for the last 2 years and done loads of practice papers”. This could make you even more stressed. Or they say “Don’t worry, I have barely done anything”. This may not be true and will give you a false sense of security. If you don’t feel comfortable sharing your marks with your friends then don’t. Having a positive attitude and the right mind set will determine how much you learn and ultimately how well you do. For example, if you repeatedly say to yourself “I’ll never be able to remember all this” then you won’t! Athletes work a lot on their mental state and use psychologists to ensure peak performance. Procrastination can also be an issue when studying; just the thought of getting started may be holding you back or not knowing where to begin. Set yourself realistic expectations and targets. Make a revision audit for each subject and break subjects down into manageable chunks, so you feel daily that you are making slow but steady progress. 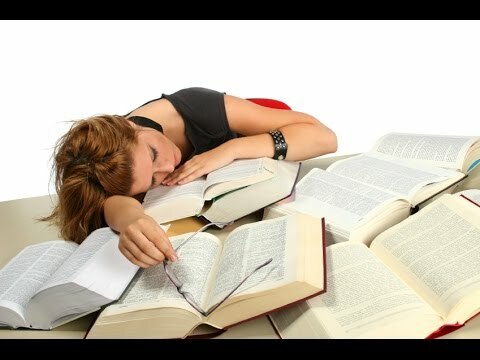 Your brain will processes information whilst you sleep, so regard sleeping as essential study time. Exercise will also help get more oxygen to your brain and work off excess adrenalin to help with keeping calm. Try and establish a regular sleep pattern and try different techniques to help with sleeping such as a warm bath, hot drink, limit caffeine, meditation and breathing exercises. Whilst GCSEs feel hugely important now, in the big picture they don’t define you. Exams looming and you’re intimidated by the task ahead? Having spent over 20 years guiding parents, I now have my eldest child sitting GCSEs in a few weeks. What advice will I give? How well a child does in exams reflects not just their ability but their attitude and method. Discipline, planning and prioritising do not come naturally to most children. Doing well is about technique (learning how to learn) and motivation. 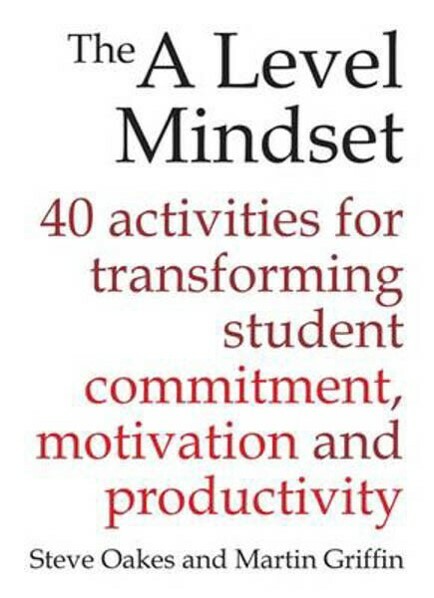 Ultimately, students have to be responsible for their learning and willing to put in the hard work. For many the standard technique of revising is reading and highlighting. This becomes quite boring, passive and ineffective. Memory needs to be treated like a muscle, so that dull information can be stored. Memorising is a skill that can be developed and improved. Different techniques obviously work for different people but to stay alert you need to keep changing and varying the revision method. Brains love colour, variety, surprise and movement. The more interested the brain is, the easier information goes in and stays in. The left side of the brain is largely used for thinking about words and numbers, while the right side is used for imagination. The right side needs to be engaged. Brains need a hook or association: picture, pattern, colour, rhyme or story connected with other memories. These hooks work best when they are devised by the student. 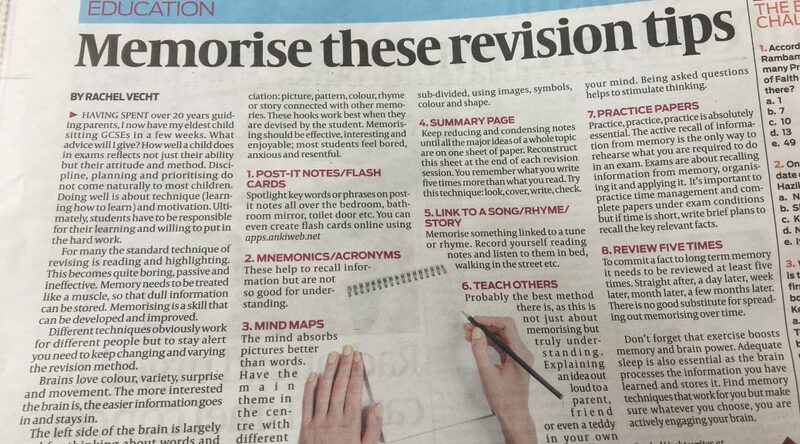 Memorising should be effective, interesting and enjoyable; most students feel bored, anxious and resentful. These help to recall information but are not so good for understanding. The mind absorbs pictures better than words. Have the main theme in the centre with different branches coming off and sub-divided, using images, symbols, colour and shape. Keep reducing and condensing notes until all the major ideas of a whole topic are on one sheet of paper. Reconstruct this sheet at the end of each revision session. You remember what you write five times more than what you read. Try this technique: look, cover, write, check. Memorise something linked to a tune or rhyme. Record yourself reading notes and listen to them in bed, walking in the street etc. Probably the best method there is, as this is not just about memorising but truly understanding. Explaining an idea out loud to a parent, friend or even a teddy in your own words, helps clarify it in your mind. Being asked questions helps to stimulate thinking. Practice, practice, practice is absolutely essential. The active recall of information from memory is the only way to rehearse what you are required to do in an exam. Exams are about recalling information from memory, organising it and applying it. It’s important to practice time management and complete papers under exam conditions but if time is short, write brief plans to recall the key relevant facts. To commit a fact to long term memory it needs to be reviewed at least five times. Straight after, a day later, week later, month later, a few months later. There is no good substitute for spreading out memorising over time. Don’t forget that exercise boosts memory and brain power. Adequate sleep is also essential as the brain processes the information you have learned and stores it. Find memory techniques that work for you but make sure whatever you choose, you are actively engaging your brain. 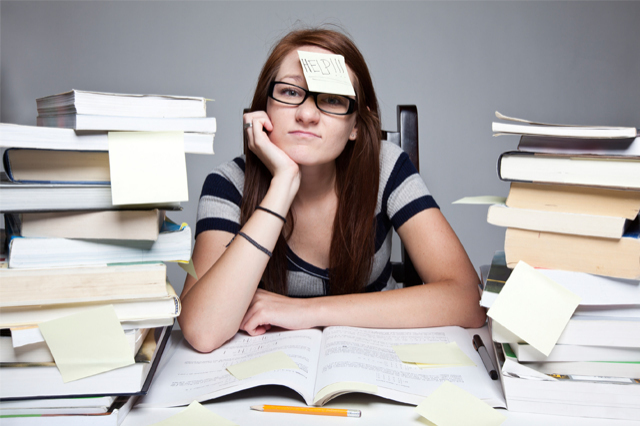 It is perfectly normal for students to feel a bit nervous during the revision period and particularly in the run up to exams. That adrenalin rush can even help motivate and focus students. However too much panicking leads to under-performance from a child who may be perfectly capable and know their subject well. In recent years, there is more and more written in the media about the state of children’s mental health and the stress they are under. This won’t be helped by the changes coming in for GCSE’s and A’ Levels. Exam periods are also worrying for parents as you think is my child working enough or too much, are they looking after themselves, will they achieve good grades? These symptons may describe most teenagers most of the time but look out if there is any noticeable increase or change in these behaviours! It is also important to try and understand what is causing the stress. Is it low motivation, lack of preparation, unrealistic expectations, competition from peers, pressure from parents or the school? Encourage your children to set their own goals of what they want to achieve. How can parents help their children manage stress? Close your eyes and breathe slowly and deeply. Breathe out more slowly than you breathe in. Locate any areas of tension and try to relax those muscles –imagine the tension disappearing. Relax each part of the body – from your feet to the head. As you focus on each part of your body, think of warmth, heaviness and relaxation. Also take a look at ADT Healthcare who offer a free helpline dedicated to assisting families suffering from drug, alcohol and mental health issues. It is not necessarily the hardest working or the brightest child/teen who will achieve the highest marks in exams. How well a child does in school reflects their attitude and study methods as well as ability. Parents and schools can give children the learning tools but then of course the child has to accept responsibility for their learning and be willing to put in the hard work. Since the summer is a time for many children to sit both public and school end of year exams, I want to focus on revision techniques. 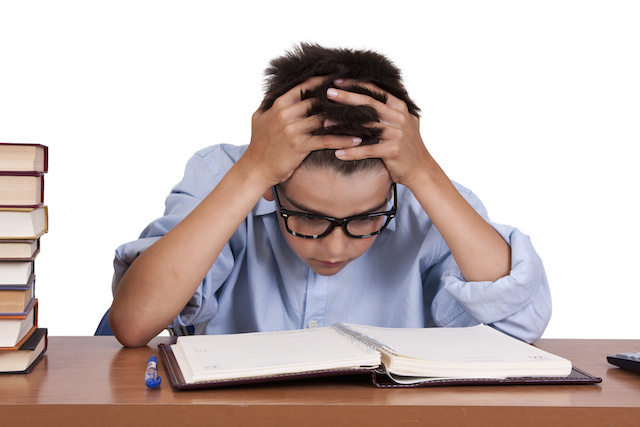 Many children rely on revising by re-reading or highlighting their school notes or the text book. This is quite boring and is not a very effective method since it ignores the way the mind works and does not require any understanding. Memory needs to be treated like a muscle so that dull information can be stored. Brains need a hook – picture, pattern, colour, story or connection with other memories. The more interested the brain is, the easier it is for the information to go in and stay in! 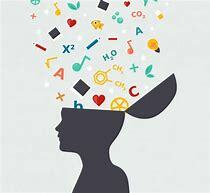 The left side of the brain is used for thinking about words and numbers but we need to engage the right side during revision and ‘work’ to get information into the long term memory. 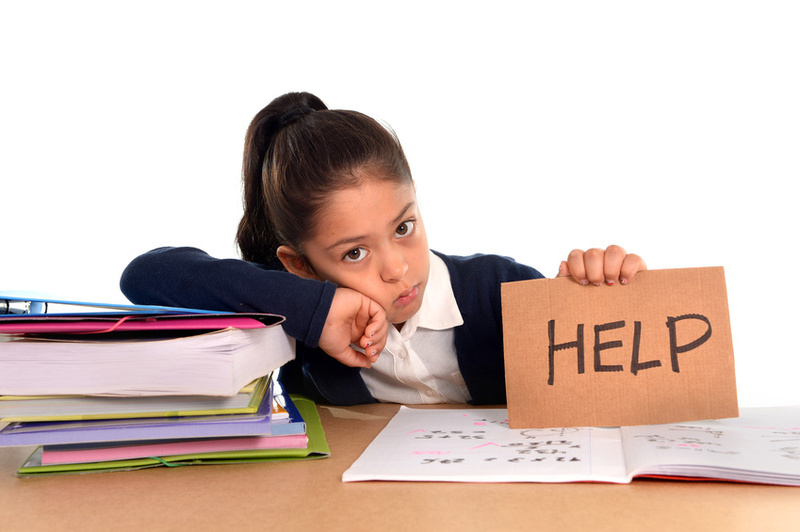 Most children feel bored, resentful and anxious during revision periods but it should be effective, interesting and enjoyable. People learn in different ways so it’s about helping your child to find a method that suits them or changing the method so the brain remains alert. Explaining out loud to parents or friends in their own words is a great way to secure and clarify understanding of a subject. 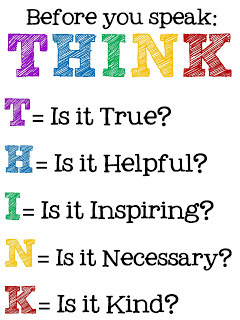 Ask questions to stimulate your child’s thinking.